That Was Then… Musical Fidelity X-LP | What Hi-Fi? Musical Fidelity's X-LP heralded the rise of the affordable stand-alone phono stage. Outboard phono stages haven’t always been a thing. Up until the late ’80s they were the preserve of obsessive high-end brands and those seeking the last percentage point of performance. Then CD took off, and vinyl sales fell off a cliff. Amplifier manufacturers saw the potential for saving costs and decided to ditch the built-in phono sections in their products. Those who still wanted to play their records had to find an alternative – and that led to the rise of the affordable stand-alone phono stage. If you’ve read the phono stage Group Test in our July issue you’ll notice Musical Fidelity’s LX2-LPS doing rather well. It’s a well-built, sensibly featured product that also sounds remarkably sophisticated. We're not surprised. 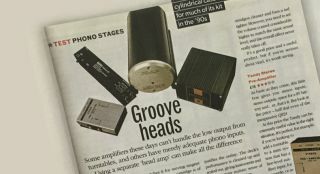 Musical Fidelity has long produced fine-sounding electronics, as the X-LP phono stage we reviewed back in July 1997 proves. The company made more distinctive-looking products back then. The X-LP was built into a lovely cylindrical casing, a design used across the range (which also included preamplifiers, monobloc power amps and headphone amplifiers). Take a look at the specification sheet and there’s not much to differentiate the X-LP from its descendant – both can cope with moving-magnet and moving-coil cartridges, though the newer product allows for adjustment of cartridge loading (albeit in a rather clunky way). Start listening to your music and the two have far more in common than the difference in appearance and the time gap might suggest. Both have a refined, spacious sound that’s packed with detail. The LX2-LPS is cleaner sounding and more precise, perhaps, but the old-timer doesn’t lose out when it comes to the fluidity of dynamics or the ability to enthral the listener. If you find a second-hand X-LP for a good price, don’t hesitate to take the plunge. You won’t regret it.